Statewide Campaign. 8th Annual Cape Fear Red Trout Celebrity Classic Tournament benefiting the Cystic Fibrosis Foundation. We have a wide stable of professional guides ready to provide the finest red drum and trout fishing this region has to offer. ESPN will cover this year’s Tournament! It’s that time again gang, so put on your game faces and bring your skills to the 2010 Cape Fear Red Trout Celebrity Classic Tournament benefiting the Cystic Fibrosis Foundation! The dates for this year’s event are October 28th through 30th. The tides are right, the reds are thick and all signs point to a super year for trout. 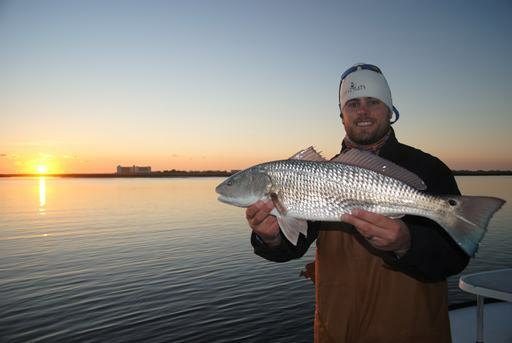 We have a wide stable of professional guides ready to provide the finest red drum and trout fishing this region has to offer. Your donation secures you an incredible weekend of professionally guided fishing, sportsmanship, a whole lot of fun and the knowledge that you have personally contributed to a worthwhile and longstanding charity that uses nearly 90% of every dollar raised for research and direct care for CF patients. All anglers, novice and experienced alike are invited. We have some exciting news to share for the 2010 event! ESPN will cover this year’s Tournament! And…..
…after several wonderful years at Figure 8 Island Marina, we have decided to “bring it on home” for 2010. That’s right, we’re bringing the event back to where it all started – Wrightsville Beach! The Blockade Runner Hotel and Resort has graciously undertaken sponsorship of our event and will be our host for all festivities, making this year’s tournament a true “destination event.” The Resort is built around family, fun and relaxation with oceanfront pool, soundside watersports facility (kayak and sailboat rentals) and spa. We will hold our annual dinner and silent/live auction starting at 5:30pm on Thursday evening, October 28th on the beautifully manicured lawn of the Blockade Runner overlooking the Atlantic Ocean. These guys put on a gorgeous event and we are really looking forward to having cocktails at sunset and dining under the stars. Friday, October 29th will start our fishing with a 6:30am breakfast and tournament sign in. Fishing will be from 7am until 4pm, when all teams must be in line to check in at the dock at the Blockade Runner. We’ll have hot food and beverages for all at check in as in the past. Saturday, October 30th will run from 7am to 3pm with the addition of our awards party, again ocean-side at the Blockade Runner starting at 4pm. We’ll have a great barbecue meal with live music, concluding with the awards ceremony. Lunch, of course, is provided each day for all anglers and their guides. Please forward this email to your fishing friends, clubs, tackle shops and anyone you think might be interested in getting in on the fun. This catch and release tournament operates on a “first come, first served” basis for guide allocation, so if you have a favorite you’d like to fish with, please get the forms in early and let us know.